What is it lately with bands cds dropping thru the post at CRR towers and they have crap name attached to them. Recently it was Gene The Werewolf (rubbish name, brilliant album), and now KingBathmat, surely the weirdest (and a contender for shittiest) in my 5 years of doing this reviewing malarkey! KingBathmat hail from Hastings, and are a psychadelic/progressive/alt rock band. Initially started by singer songwriter John Bassett, they have released six albums to date, with Truth Button being their latest since 2009’s Gravity Field. 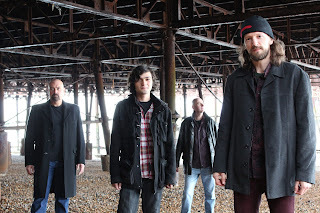 The band comprises of Bassett (Bass/vox), David Georgiou (Keys), Lee Sulsh (Guitar), and Bernie Smirnoff (Drums). The album cover for starters take you back to the heady days of 70s prog rock. It looks like some obscure German prog rock band that the likes of Mikael Akerfeldt would pay thousands for to have in his collection. The link with Opeth doesn’t stop there. KingBathmat are a refreshing blend of the likes of Opeth, Porcupine Tree, Genesis (the good one! ), and more modern takes like Radiohead and Muse. Which is a fine example of how progressive rock should be played out, an aural journey, heavy and riff laden one moment, then subtle and tranquil the next, all woven together with Bassets craft and vocal stylings. Truth Button deals with an underlying theme of technophobia and social disconnection due to the ever-growing trivial use of modern technology. Good job I’m writing this up on my typewriter then!! It calls for the advancement of technology to be employed to make the truth more transparent as opposed to it being exploited to confuse, convolute and restrict us. If you had a Truth Button, would you push it, or would you chose to live in your ignorant bubble. 'Behind the Wall' takes a metal riff and combines it with a Dave Grohl vibe to make for an enjoyable opener. Again crunchy metal riffs converge with a bass groove for 'Abintra', and is a close a feel to Porcupine Tree/Storm Corrosion as you’re ever likely to meet. If Matt Bellamy and Peter Gabriel did an Elton John, KingBathmat would be the proggy offspring as witnessed on 'The End Of Evolution'. The album flows really well, as the 50 minutes is over in a breeze, and before you know it you're onto the weirdly and wonderfully titled, ‘Coming To Terms With Mortality In The Face Of Insurmountable Odds’ with see them throw all manner of styles (and the prog handbook & sink) into the 10 minute stunner. Your fave prog band you’ve yet to hear!